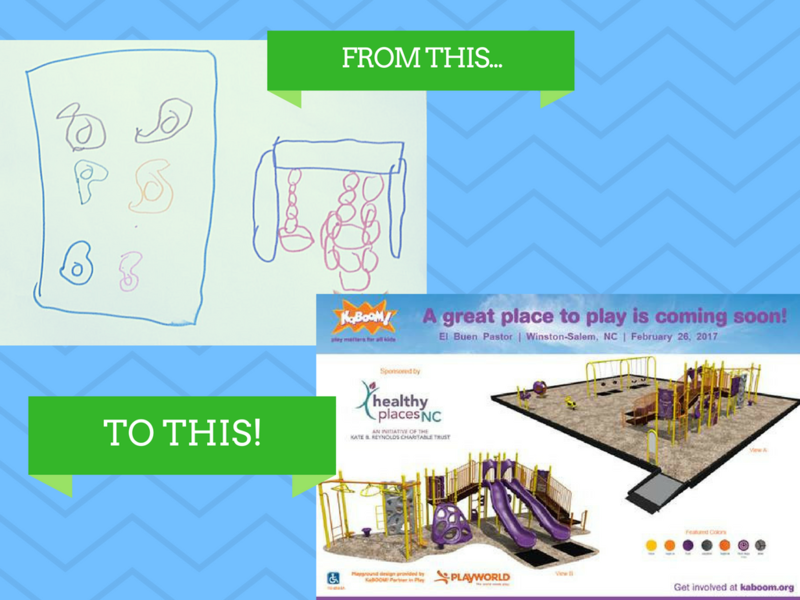 What started as children's drawings is about to become a real PLAYGROUND and YOU can help us make it happen! The Playground is a gift from Kaboom! and Kate B. Reynolds Trust, but we have to do our part and we'll need your help. Our community match goal is $8,500. We've already got $3,000 committed! Come and join us for a play date on February 26th! Sign up to volunteer OR make a contribution to our community match goal of $8,500. * If you can't be with us in person on build day, consider loaning us some of the tools we'll need to get the work done. If you are able to bring tools to the build day, check this list to see what is needed and send us an email! A playground is more than a playground. It’s a brain-expander, friend-maker, and muscle-builder. Play is central to a child’s ability to grow into a productive adult. It can transform children from sedentary, bored and solitary to physically, mentally and socially active. Since 1996, KaBOOM! has been dedicated to the bold goal of giving all kids – particularly those growing up in poverty in America – the childhood they deserve, filled with balanced and active play, so they can thrive. With its partners, KaBOOM! has built, improved and opened nearly 16,300 playgrounds, engaged more than one million volunteers, and served 8.1 million kids (#playmatters). The new playground will bring more than 250 kids in Winston-Salem one step closer to having the play-filled childhood they deserve. In building this playspace together, we are making it easier for all kids to get balanced and active play and making Winston-Salem more playable. Currently, the playground equipment at El Buen Pastor is outdated and in need of replacement. This new playground will provide the kids of the surrounding community a safe, accessible place to play. The playground is being built by the Kate B. Reynolds Charitable Trust and KaBOOM!. Through this partnership, more children will have the joyful childhood they deserve. The Kate B. Reynolds Charitable Trust supports KaBOOM! in promoting and protecting a child’s right to active play at home, at school and in the community. *Any donations received in excess of the $8,500 community match goal will go toward the programs that utilize the playground.